The occasion is CPJ’s 25th Annual Press Freedom Awards Dinner, a fundraiser for the organization. Gannon, who was shot in Afghanistan last year, will add CPJ’s honor to those she has recently received from journalism schools across the country. They include the John Peter and Anna Catherine Zenger Freedom of the Press Award from the University of Arizona School of Journalism, the Grady College McGill Medal for Journalistic Courage from the University of Georgia and the James Foley Medill Medal for Courage in Journalism from Northwestern University’s Medill School of Journalism, Media, Integrated Marketing Communications. As I met with students, I got to talk about the fundamentals of our profession and how they haven’t changed, other than to become even more important and precious. We talked about the real importance of thoughtful questioning and how belligerence was not the sign of a good interviewer, but rather it was the quality of the questions that mattered. We discussed how, as journalists — whatever our medium — our job is to inform and it comes with a price. That price isn’t only about facing danger. It is also about choosing to dig deeper, asking tough questions, researching and understanding our subject. It is about refusing to be intimidated and having the courage to step away from that “good vs. evil” precipice that has, at times, tainted reporting, impacted how stories and conflicts are covered. I got to tell them what a joy it is to do this work and it took me back to my beginnings and reminded me again of how incredibly lucky I am, have been and continue to be. While I shared with them the circumstances of the shooting in April 2014 that took Anja [Niedringhaus] from me, I also told them of the joy we shared in our friendship and in the work we did. I had the chance to tell them about the incredibly kind and caring family and friends I have and how the AP and the people who make up the AP have stayed by my side, helping me, supporting me and giving me strength. I got to tell them how we are more than a news organization, we are people from every part of the world who have the kindness in their hearts to reach out to say: “Hang in there” and to give you the support and the strength to do just that. Gannon has covered Pakistan and Afghanistan as a correspondent and bureau chief since 1988. She also has reported from the Middle East, including the 2006 Israeli war against Hezbollah in southern Lebanon. In 2005, she authored “I is for Infidel: From Holy War to Holy Terror,” an examination of the Taliban and post-Taliban period, published by PublicAffairs. Watch Gannon accept the school’s McGill Medal here. Watch Gannon’s Q & A at the University of Arizona School of Journalism here. 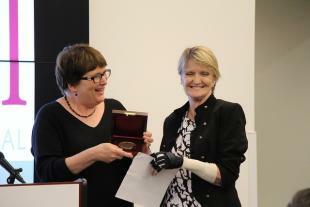 Watch Gannon accept the James Foley Medill Medal for Courage in Journalism here.